Home / back pain / What is a Bulging Disc? An intervertebral disc is the cushion between two vertebral bodies that helps absorb the stresses placed on the spine. It has a soft, jelly-like center, with a more fibrous surrounding rim called the annulus. Over time, the outer annulus weakens due to either the aging process or repetitive stresses. When the rim of the disc is weakened, the inner gel-like portion of the disc is able to push it outward when placed under pressure; this is called a “disc bulge.” Many people have a bulging disc without knowing it; studies have shown that many patients without any low back pain or other spinal symptoms have bulging discs on MRI. 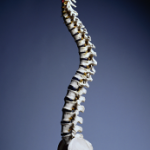 With age, spinal discs naturally become drier, less flexible, and less able to resist extreme stresses. When an aging disc does experience a stress that exceeds normal activity, it can lead to small tears that weaken the rim of the disc. Patients with a back injury or who have had repetitive extreme stresses to their backs may also be at risk of this type of weakening. Smoking is another factor that has been linked to the weakening in the rim of the disc that can lead to disc bulging. Bulging discs can cause symptoms if they press on a nerve, causing irritation and inflammation of that nerve. In the lower back, pressure on nerves can lead to pain running down into the buttock, legs, and feet. If the bulging disc is located in the neck, pressure on nerves can lead to pain going into the shoulders, arms, and hands. It is important to remember that bulging discs are a very common condition, and should not necessarily be thought of as an “injured” disc. In many cases, even when a patient does have pain down one’s arm or leg from a bulging disc, nonsurgical treatment can successfully treat the symptoms. However, in cases when nonsurgical management is unsuccessful, there are surgical options to help relieve the pressure on nerves caused by a bulging disc. If you have been told that you have a bulging disc and want to know whether it is causing symptoms that you have in your back or legs, a spinal specialist may be able to help you better understand your condition. A spinal specialist can best determine whether your symptoms are due to a bulging disc or a different problem in your spine and then work with you to create a plan to help you. Whether you have bulging discs or other spinal problems causing symptoms, the most important thing is your ability to live a life with less pain, more flexibility, and greater function.